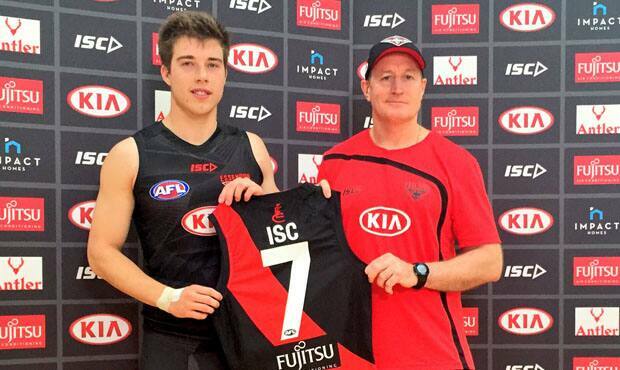 Zach Merrett and John Worsfold announced the seven year deal with ISC after training today. Essendon Football Club is excited to announce it has signed three new apparel partners for the 2017 season. The Bombers players were greeted with their new ISC, SKINS and New Era apparel at today’s first training session of the pre-season. ISC has signed on as the Club’s Official On-field Apparel Partner for the next seven seasons, making it one of the largest apparel partnerships in the AFL. The Australian owned company will supply the Club’s Official On-field playing Guernseys, shorts and socks, as well as a comprehensive range of training and off-field apparel. Its business model of relationship-led sporting partnerships, supported by quality products and an innate understanding of the Australian sports landscape has been a large part of its success. Brett Corrick of ISC said their vision is to empower the players to be the best in their sportswear. "It's a major milestone for ISC to be announced as the 2017 Official On-field Apparel Partner of the Essendon Bombers, one of the oldest and most respected AFL clubs,” Corrick said. “2017 will be one of the most important seasons in the Bombers illustrious history and we are honoured to have been chosen to share this journey with them. “We take pride in providing technologically advanced, quality merchandise and kits, and partnering with the Bombers for 2017 will play an integral part in supporting our home grown success." Essendon CEO, Xavier Campbell, welcomed the three leading and progressive apparel brands to the Essendon family. “We are extremely pleased ISC, SKINS and New Era will be part of our comeback story,” Campbell said. “These are three innovative and progressive sports brands, and their decision to partner with Essendon is an important step in the future direction of our Club. “This is the first time we have segmented our apparel partnerships, and we are excited about the benefits the new range will deliver from a performance and retail perspective. The full range of ISC and New Era apparel is available in the Bomber Shop at the Club’s Tullamarine headquarters.